It's out: a fully revised (almost completely rewritten!) awareness and training module on phishing. Phishing is one of many social engineering threats, perhaps the most widespread and most threatening. Socially-engineering people into opening malicious messages, attachments and links has proven an effective way to bypass many technical security controls. Phishing is a business enterprise, a highly profitable and successful one making this a growth industry. Typical losses from phishing attacks have been estimated at $1.6m per incident, with some stretching into the tens and perhaps hundreds of millions of dollars. Just as Advanced Persistent Threat (APT) takes malware to a higher level of risk, so Business Email Compromise (BEC) puts an even more sinister spin on regular phishing. With BEC, the social engineering is custom-designed to coerce employees in powerful, trusted corporate roles to compromise their organizations, for example by making unauthorized and inappropriate wire transfers or online payments from corporate bank accounts to accounts controlled by the fraudsters. As with ordinary phishing, the fraudsters behind BEC and other novel forms of social engineering have plenty of opportunities to develop variants of existing attacks as well as developing totally novel ones. Therefore, we can expect to see more numerous, sophisticated and costly incidents as a result. Aggressive dark-side innovation is a particular feature of the challenges in this area, making creative approaches to awareness and training (such as NoticeBored!) even more valuable. We hope to prompt managers and professionals especially to think through the ramifications of the specific incidents described, generalize the lessons and consider the broader implications. We’re doing our best to make the organization future-proof. It’s a big ask though! Good luck. Stimulate people to think - and most of all act - more securely in a general way, for example being more alert for the clues or indicators of trouble ahead, and reporting them. 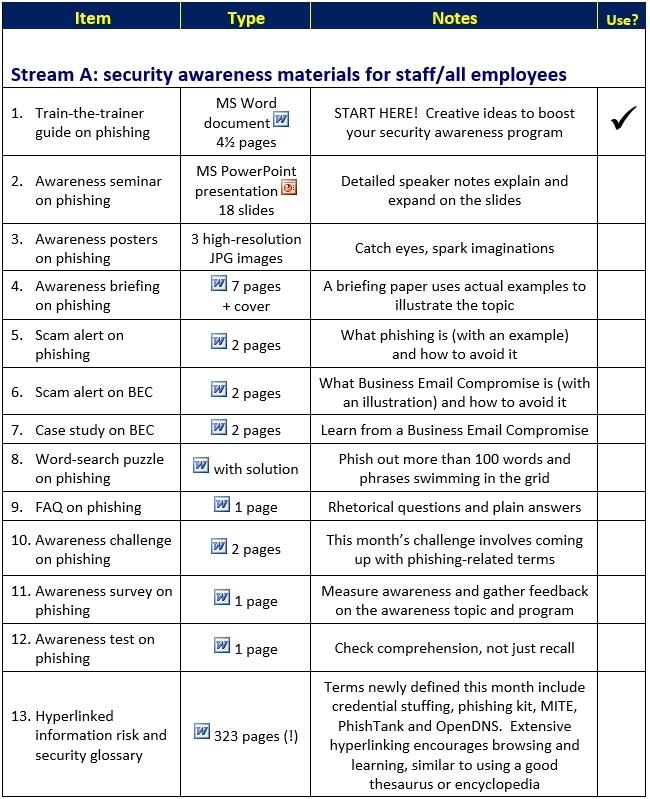 Consider your organization’s learning objectives in relation to phishing. Are there specific concerns in this area, or just a general interest? Has your organization been used as a phishing lure, maybe, or suffered spear-phishing or BEC incidents? Do you feel particularly vulnerable in some way, perhaps having narrowly avoided disaster (a near-miss)? Are there certain business units, departments, functions, teams or individuals that could really do with a knowledge and motivational boost? Lots to think about this month! Get in touch to purchase the phishing module alone, or to subscribe to the NoticeBored service for more like this every month. Phishing is undoubtedly an important topic for awareness and training, but definitely not the only one. Build and sustain your corporate security culture through NoticeBored.